Older And Wiser Heads Outnumber Younger Users On Facebook. Posted on 29th June 2011 at 08:37. Contrary to some of the rumours that have spread over the internet in the last few weeks, Facebook is alive, well and flourishing. Well, that is if the latest set of statics to be released is to be believed. Other studies have indicated that the social networking giant was losing users hand over fist in both the U.S and the UK, but the latest research by Nielsen indicates that the numbers are actually growing, particularly among the over-50s. So, is this good news for the social media platform, or is there likely to be a sting in the tail somewhere down the line? Well, I think the answer’s possibly yes to both of those. Overall membership of Facebook’s social network grew by 41% between 2009 and 2011, according to research firm Nielsen. 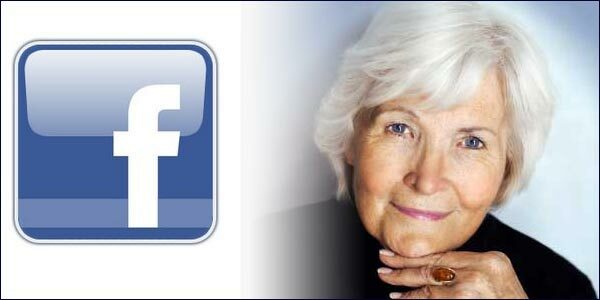 However, during that same period Facebook use among the over-50s grew by 84% – faster than any other group. The figures for Twitter were similar: however, for every ‘older’ user that signed up to the cause, there seems to be a younger casualty who resigned. The study was commissioned by UCOM, the UK Online Measurement Company, which is funded by advertisers and media agencies and studies the behaviour of a panel of internet users both at work and at home. It found that in May 2011 alone, the network was visited by 26.8 million people in the UK, making it more popular than the combined sites of MSN, Windows Live and Bing. Only Google itself was more popular for the period. Twitter, too, fared well reaching figures of 6.14 million unique visitors in the same time frame: an increase of 34% on the previous month. Visitors to Twitter, aged over 65, grew by 96% in April. Business use also grew, but by nowhere near the same amount: LinkedIn clocked up 3.59 million visits – an increase of 57% more than April. So, is this really the news that Facebook has been waiting to hear? So what are the down sides to this recent surge in growth? Are there likely to be consequences that maybe Facebook would rather didn’t happen? Well, potentially yes there are. Put yourself in the shoes of the younger user: would you want your folks to read about what you’ve been getting up to? Even worse, do you really want to know what they’ve been doing? Probably not. No matter how broad the appeal of a social network, it can never heal the generation divide. So why should that be a problem? Well if younger users do decide to vote with their feet, it could have knock on consequences for any proposed stock market debut. Advertisers may find older users attractive, but a successful flotation is dependent on Facebook’s continued growth towards the targeted 1 billion worldwide users. This figure underpins what many see as a wholly unrealistic suggested flotation price of $50 billion. If the younger generation move on to pastures new, then this target is going to prove extremely difficult to achieve. What then for Facebook and its aspirations? SME’s Gain More Business Through Social Media Marketing Than Larger Companies .Google Finally Admits To FTC Anti-Trust Investigation Into Search Practices.